In this Wednesday, Oct. 14, 2015, photo, a Chechen bride dressed in national costume is surrounded by her relatives, as she waits for her wedding ceremony to begin in Grozny, Russia. The influx of refugees and the threat of terrorism pose a major challenge to European tolerance. Europe, however, will have to keep searching for a way to peacefully co-exist with people from various cultural and religious backgrounds. Russia faces a similar challenge when dealing with inhabitants of the Northern Caucasus, a region that is known for its unique and complex traditions. Ogonek Magazine looks at the lives of women in modern Chechnya. Every weekend there are one or two weddings in the Chechen village of Achkhoy-Martan (central part of Checnya - RBTH). People dance before an open fire, but the bride is conspicuous by her absence. She quietly waits all day in one of the corners of the groom's house. Her mother before her also waited in a similar corner, as did her grandmother, as will her daughter and granddaughter will after her. But maybe not! Amina's daughter-in-law has baked cakes from corn flour, and is setting the table. Amina's son had taken a liking to her, and so she went “to check her out.” Amina did not care whether the girl was tall or short, fat or thin. The most important things were whether the potential bride was modest or not, and who her parents were. Amina herself had married late by Chechen standards - she was 18. Her husband's relatives had come and arranged it. And Amina's father gave his consent. Amina believes that her heart is now the strongest muscle in her body. It has hardened and almost turned to stone. We walk out into the courtyard and stand by the barn. The grass is covered with manure pancakes. “You can't imagine how we lived our lives,” she says calmly, without complaining. “Every day there were bombings, airplanes. I was asking myself why did I have children - they don’t see anything positive anyway. Children…. When our children were killed, we stood by with stone faces. Tomorrow is the wedding. I don’t know the bride, groom or the family. I'll go there without an invitation. Today the bride can be found in the beauty parlor. At Golden Scissors in the center of Grozny you can hear women laughing. The hair dryers are rattling. Mostly widows work here. The parlor is owned by a widow, a tall woman in black. Her name is Nurbika. The shelves in her cabinet are filled with cosmetics. Nurbika is a rare businesswoman in Chechnya. A working woman is a disgrace for a man. It means he was not able to feed her. But the war, as they say in Chechnya, turned everything upside down. Men, who were humiliated at the checkpoints in the presence of women and children, could no longer find work. After the war, women began to view work differently. In Rostov, Nurbika's daughter started distributing cosmetics. Nurbika decided to help her, and on New Year's Eve in 1999, she started selling cosmetics in Grozny. It was incredible - war was raging but the women bought everything. In one week Nurbika earned 20,000 rubles, and as soon as the war ended she opened a salon and a billiards club. All her children went to university. She built a new house to replace the destroyed one. Men respect her. Biberd has a high-ranking job at the Interior Ministry. I'm at his home in Urus-Martan. At the table are his mother, wife and two daughters, who have already finished school. His mother seems to be a very old woman - heavy work and many children make Chechen women age faster. A Chechen woman has it best when she is old. This is when her daughter-in-law does all the work. Biberd's wife Luisa sits quietly - she still has a long way to go before she gets old. “He said he'd return,” says Luisa, a woman who is faithful to Chechen traditions: it is forbidden to call your husband by his name. “One, two, three, four to the right, one, two, three, four to the left, one, two, three…” one day Biberd was running away from an Arab sniper. He was running on the snow towards a Grozny school that was an outpost for Russian soldiers. He was running with a Russian flag in his hands. “In the army they taught us that even the best sniper aims for six seconds," says Biberd. “You count to four then turn right, again to four and turn left…"
Biberd reached the school and the sniper missed. He managed to get to the roof and crawled till he hoisted the Russian flag. The flag was shot down, but Biberd again raised it over his head. When Biberd finally did return, there were no embraces, no “extra talk.” Luisa only looked at him, suppressed a sigh in her chest and went to set the table. 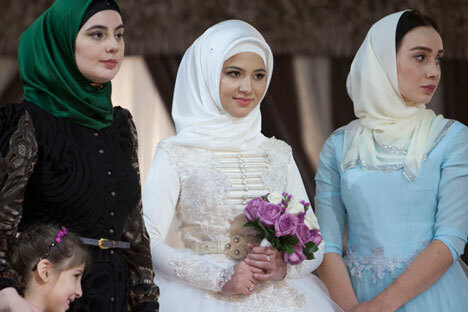 In this Chechen family, as in the others, emotions are under lock and key. Edilbek Magomadov is an ethnographer from the Culture Ministry and a connoisseur of Chechen traditions. During the war he would be stopped at the checkpoints and asked to remove his pants - to show his knees. Knees that are intact are proof that the man did not crawl on the ground with a rifle in his hands. For a Chechen man being stopped alone is insulting. A concrete floor. A high fence. Dim electric lighting. Men form a compact circle - there are 50 or 100 of them, I can't tell. A loud male moan is heard above them and the circle comes to life - it starts walking clockwise, slowly. The men lean on their right leg. Heads hang limply. Hands clap. Shouts. The pace accelerates. The men are running along the circle. A din of male voices rises above it. "La illhi, il Allah!" Legs, arms flicker. A rhythmical song resembling an echo forces your heart to pulsate. The men are in a trance. The audience is in a trance. It seems that Chechen traditions will never die as long as boys are taught to dance the Zikr, a form of Sufi devotion. An old woman died in this house. Earlier, she was wrapped in a rug and buried. Hundreds of relatives came. The men are dancing their farewell dance for her.